I'm not sure there is anything gloomier than rain while staying at a budget hotel in a small Kyrgyz town. 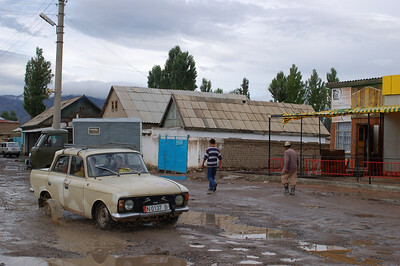 The hotel in Kochkor: no running water, a bathroom consisting of a shack in the back of the hotel and a grumpy attendant who turned her radio on full blast at 6a.m. (I suspect to piss us off). We had a few sad encounters with heavily intoxicated men wandering the rainy streets, but we mainly rested in our hotel until the rain finally subsided 2 days later. For the next three days we stayed in Cholpon Ata, a town on the north shore of Issyk Kul Lake. Cholpon Ata isn't a backpacker destination, it's a everyone else in Kyrgyzstan destination. It's a beach resort, summer party town, packed to the brim with vacationing Kazakhs, Russians and city folk. When we arrived in town, the sun was shining and the beach blow up toys were out, we joined the crowds of people streaming towards the beach. 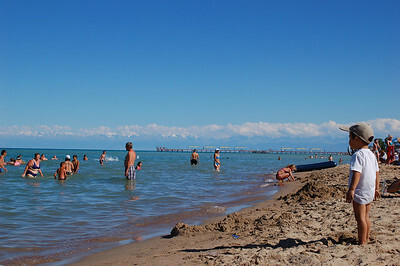 The road to the beach is lined with shops selling, well, mostly alcohol, but also sea shells (there are no sea shells at Issyk Kul Lake), smoked fish, samosas, beach toys, bathing suits... The beach was totally packed but we were so happy to get some sun. On our second day in Cholpon Ata, we went to the beach again but spent the afternoon on an educational excursion to the local petroglyphs. The outdoor 'museum' consists of a giant pile of rocks scattered across a few kilometers. The first few petroglyphs are indicated by small signs, but I suppose funding ran out, and for the rest of them you're on your own. We didn't manage to find too many but had fun in our attempt "Yann, Yann here's one... oh no wait... it's just a another rock". In the evening we feasted on outstanding local smoked fish, cheese, bread and a bottle of Moldovian wine (not so outstanding). After two days, we had to move on, but Yann REALLY liked the beach, neither of us had seen that much skin in a long long time. There was possibly a little bit too much of it, although it was refreshing to see the GIANT bikini clad Russian babushkas being lathered with sun screen by their hairy speedo wearing husbands. Some of the more hilarious Kyrgyz beach activities included being photographed with a large boa, riding a camel or my favourite (and most common): getting really sunburned and drunk. We followed the north shore of the lake until we got to the old Russian outpost of Karakol. We arrived in the pouring rain, were rejected (in Russian) from the cheapest hotel in our book, so we settled for a more upscale backpacker hangout (second cheapest). It was a lovely old colonial home, run by little Babalina an old Russian matriarch. 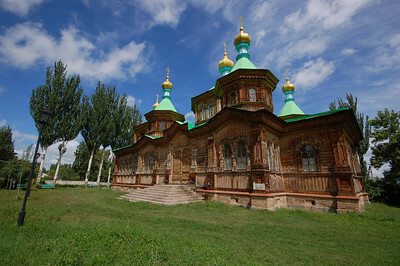 We had scheduled three days in Karakol, but we managed to visit its main sights in, hmm let's see, 45 minutes. This included the Russian Orthodox Cathedral, the Dungan Mosque, the regional museum and a bunch of statues of guys we didn't recognize (except for Lenin of course). 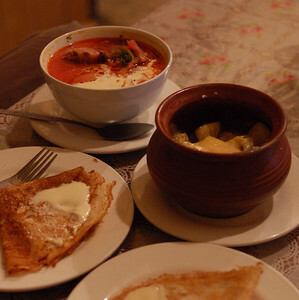 Despite an unrivalled collection of stuffed animals at the regional museum, the highlight of Karakol had to be Zarina's Cafe, the local cafe around the corner from our guesthouse, in particular its 'pelmeni in a pot'. Pelmenis are little raviolis stuffed with meat, 'pelmeni in a pot' is a pot full of pelmenis doused in garlic, sour cream and cheese then baked in an oven. Pelmenis pretty much kept us in Karakol longer than was necessary. je crois que le voyage fut très fatiguant mais la photo de Yann à la plage avec cette dame qui n'est sûrement pas Émilie est des plus rafraîchissantes(plusieurs personnes l'ont bien ri !!!). A new look for Yann....the master of disguise. He blends in everywhere. Those beach shots are hillarious. "Emilie likes watermelon" LOL. You guys are nuts.